A pet peeve of mine is the misunderstanding of BBQ in general. For instance, people tend to judge American BBQ all in one category like they should all be the same. That is an unfair way to compare and really, there are many different types of BBQ with their own nuances. Hence, when descriptions like "dry", "too saucy" or "not saucy enough" are used universally, it makes me cringe. 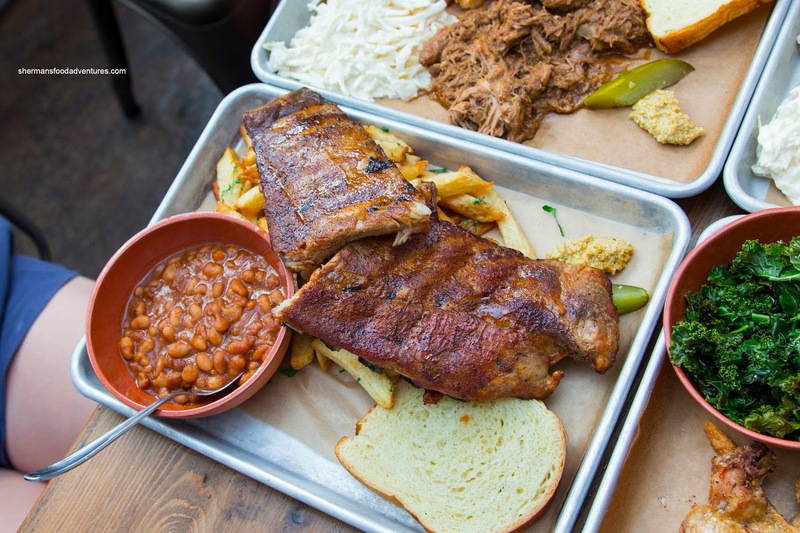 Some forms of BBQ are meant to be without sauce and others are basted with sauce. To top it off, the sauces, depending on the region, are also very different. We recently checked out Whiskey Six BBQ and their Westcoast BBQ. From what I can gather, they seem to employ similar techniques found in Texas BBQ but not completely. 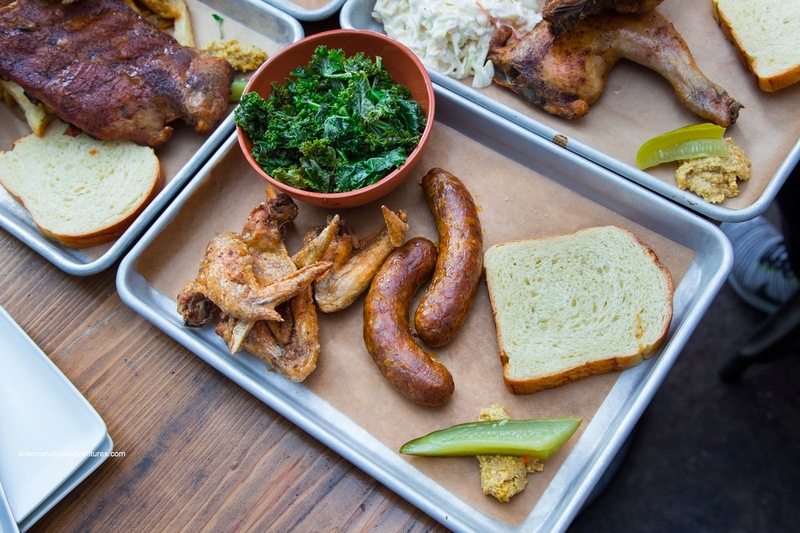 Instead of the platter, we decided to order each individual meat a la carte. This way, we could control the portion size of each and also have more sides. We agreed on getting the medium size of the Johnston's Prohibition Pulled Pork with the sides being Southern Biscuits and Coleslaw. Meaty and fairly moist, the pulled pork was actually quite wet. That was fine as it beats being dry. The flavour was mild, so I used some of the supplied BBQ sauce. It was rich in colour, but mild-tasting as well. There was some smokiness and background tang, but it could've been saltier. The biscuits were firm on the outside and somewhat soft on the inside. It was fine but did have a baking powder finish. I found the coleslaw to be overdressed as it was sloppy and wet. However, the flavours were quite good with an impactful tang and creaminess to go with the fresh crunch. My favourite meat of the bunch was the Blue Goose Cattle Co. Organic Beef Brisket which was also in medium size. It was smoky with a nice flavourful bark. Although it wasn't exactly succulent, it was a tender and fatty. This didn't need any sauce in my opinion as the caramelized flavours and smokiness really did come through. 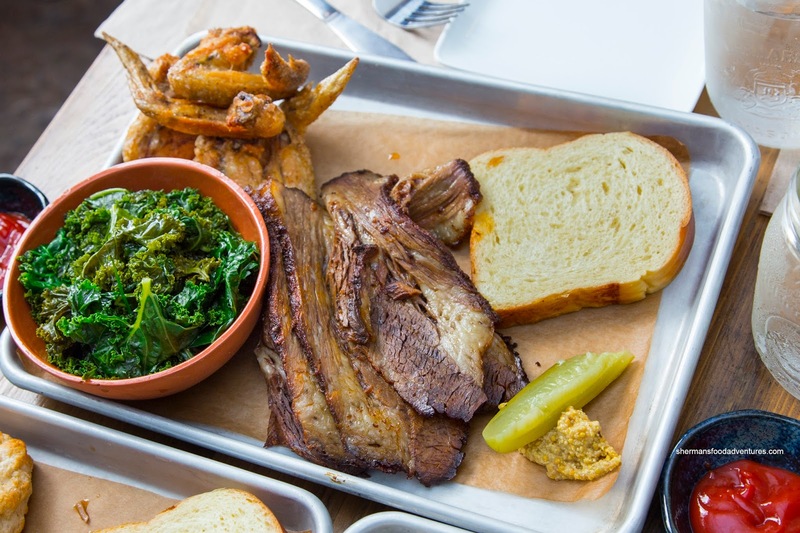 For the sides, this one came with Braised Greens and Chicken Wings. The braised kale was still chewy and not overdone, yet underseasoned. As for the wings, they came as one piece with the drummette and wing tip attached. They were pretty crispy on the outside with well-rendered skin. It definitely needed the accompanying hot sauce or BBQ sauce since they were mildly salted. The meat was neither juicy nor dry. The full rack of Johnston's Pork Ribs were pretty decent where most of the meat was tender and not completely dried out. They weren't juicy per se, but for a smoked rack of ribs, these were fine. The smokiness was minor while the inherent flavours were mostly natural pork flavour. Again, the side of sauce was necessary for both moisture and added punch. Underneath, the mound of fresh cut Kennebec Fries were quite good. They were crispy and stood up to the ribs sitting on top of them. There was some potatoness left even though they they had been fried twice. The other side of Smoky Beans were much less sweet and smoky than we were used to. It didn't matter though as we prefer these mild-tasting beans over the sickingly sweet version. 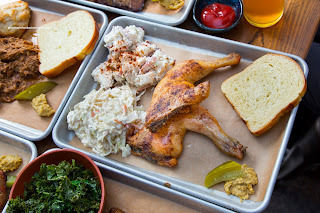 We ended up getting the 2 Free Range Framcrest Chicken Legs with coleslaw and Potato Salad. Similar to the chicken wings, the legs featured fully-rendered skin which were crispy and completely edible without any fatty portions. The meat underneath was not dry, yet not juicy either. However, we fully expected this for a free range smoked chicken leg. On the other hand, the smokiness was again very much in the background. Also like the chicken wings, the meat was not very flavourful and needed the sauce in that regard. Mind you, with this type of BBQ, unlike the Texas version, there isn't a tonne of sauce slopped onto it. The chunky Potato Salad was good with cooked-through potatoes that still retained a firm texture. It wasn't over-dressed where the flavours were slightly sweet with a mild tang. Our last dish was the Windsor Meat Sausage Links (which we got 2) with more chicken wings and braised greens. This was another favourite featuring tasty and impactfully seasoned sausage. They were meaty with only enough fat for texture and full-bodied flavour. There was a noticeable spice that wasn't overwhelming. With all of the meals, they included Fife Bakery bread, Barrelhouse brine pickle and grainy mustard. 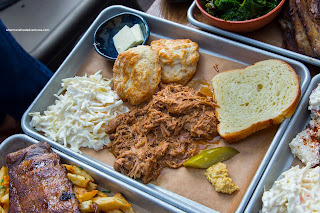 Overall, I found the food at Whiskey Six BBQ serviceable with some highlights. Things could've been more impactful in terms of seasoning though. 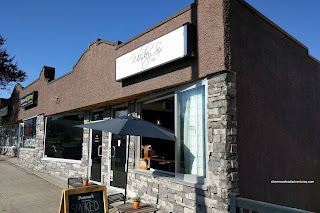 Loved the personable and friendly people there as it made our meal relaxed and enjoyable.